Manufacturers description: "Selected by some of the most skilled saltwater anglers in the world. Everything you need is included but take several sets!" 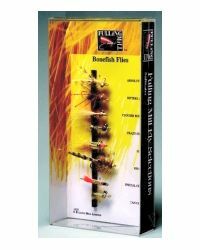 Contains 9 Bonefish Flies: Gotcha, Tan Charlie, Crazy Charlie, Bitters Amber, Go-To-Joe, Absolute Flea, Hoola Shrimp Pearl, Clouser Bone Tan, Bonefish Special.